Note: This review originally appeared on bythom.com on October 26, 2009. It's been cleaned up and refreshed slightly for the sansmirror site. I include it here so that you can compare older with newer cameras in my reviews. I've been advocating a "small" competent camera for quite some time, either a compact type camera with an APS sensor (e.g. a Coolpix with a D5000's guts) or a scaled-down DSLR (an FM3a-sized body with the D5000 core). Both are possible. Neither seem to be on Nikon's horizon. Yet the micro 4/3 partners, Panasonic and Olympus, most certainly see what's possible. I recently reviewed the Olympus E-P1, and that immediately brought up the request to also review the Panasonic GF1, which came out shortly after the E-P1. Both are cameras with similar user targets. The Olympus has retro styling, the Panasonic more modern styling. The micro 4/3 initiative targets the gap between compacts and DSLRs. From the bottom it's a big gap in two primary ways: image quality and focus performance. The compact camera user is looking at their terrible high ISO results and image noise, plus doesn't like the lack of responsiveness of the focus system (try photographing a two-year old and you'll know what I mean: both things tend to come into play, as the child is often indoors and moving a lot). From the top the gap really is all about "I want my current quality in a smaller size and weight." I'll get to the GF1 basics in a bit, but first I want to talk about impression. While the Olympus E-P1 was decidedly retro in design and evoked small film cameras of the 60's, Panasonic has chosen to make the GF1 look pretty much like a modern compact camera that did a bit of steroid consumption. Indeed, if you set a LX3 next to a GF1, you can see the design inheritance very easily. That's not to say there aren't differences. But more on that later. 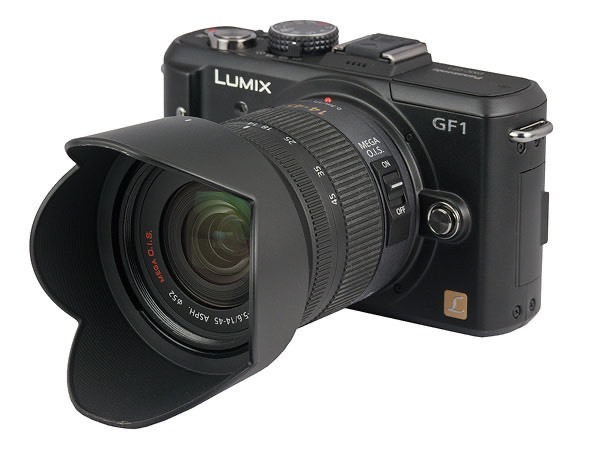 The GF1 is a micro 4/3 camera (I abbreviate that m4/3). That means that it uses a 4/3 format sensor. Such sensors are 13.5x18mm in size, or approximately one-quarter the size of 35mm film (the imaging area is slightly less). This makes the 4/3 sensor smaller than the DX sensors used in Nikon cropped DSLRs, but as much as nine times larger than the sensors used in compact cameras. If you want the full story of the 4/3 development (told from the vested interest viewpoint of the developer, so beware of marketing claims), see www.four-thirds.org. This isn't the place to get into the sensor size arguments (usually boiled down to a slightly misleading "larger is better" mantra), only to note that 4/3 sensor is at the bottom of the DSLR class sensor sizes, and all DSLR sensors are substantially larger than compact camera sensors. Put another way, you expect a 4/3 camera to perform more like a DSLR than a compact camera. We'll leave it at that for now. I'll have more to say in the Performance section later on. The "micro" part of micro 4/3 refers to an extension of the original standard to remove the mirror box of traditional DSLRs, thus making for potentially thinner cameras. Olympus and Kodak created the original 4/3 standard. Panasonic, Leica, Fujifilm, Sanyo, and Sigma all joined the standards group later. As far as I know, only Olympus and Panasonic have agreed to the m4/3 standard, though it appears that others will be joining soon. At present, only Olympus and Panasonic make 4/3 or m4/3 bodies, only Olympus, Panasonic, and Sigma have made 4/3 lenses, and only Olympus and Panasonic have made m4/3 lenses. That last bit is important relative to the GF1. The m4/3 standard has a lens mount that is very close to the sensor (little depth). To get the full reduction in size possible, you need to use m4/3 lenses. As I write this, we have eight, with several others claimed to be on the way. However, since the m4/3 mount is so close to sensor, it is easy enough to build an adapter for virtually any lens type. Both Panasonic and Olympus make an adapter for 4/3 lenses (which opens up another 36+ lenses for use on the GF1). I use Voigtlander adapters to mount my Leica and Nikon lenses on my GF1. As I noted, you can mount just about any lens on a m4/3 camera if you have the right adapter. Of course, only 4/3 and m4/3 lenses are going to be fully (or in a few cases mostly) functional, which is why I noted how many of these lenses exist. The final part of the 4/3 puzzle you need to know is that the crop factor is 2x. Thus, if you have a 14mm lens on your GF1, you have an angle view equivalent of 28mm compared to film (or FX sensors). Put another way: whatever focal length you used on film or FX bodies, you'd need half that focal length to get the same angle of view on an GF1. The sensor in the GF1 is the same 12mp Live MOS part made by Panasonic that was used in the G1 and is also used in the Olympus E-P1. The 12mp effective megapixels mean 4000x3000 pixel images, enough to produce straight-from-camera prints up to about 11x14" without resizing (note that the Olympus E-P1 stretches a few more pixels in each direction out of the same sensor). Close observers will note that 4/3 uses a 4:3 aspect ratio (four wide to three high) rather than the 3:2 aspect ratio Nikon uses on its DSLRs. You can also set 16:9, 3:2, and 1:1 crops, though you'll lose pixels in doing so. The base ISO of the sensor is 100, with full stop increments up through ISO 3200 (the E-P1 stretches this to 6400). The GF1 uses a weird shutter arrangement: normally the shutter is open when the camera is at rest, revealing the sensor when you change lenses. The shutter does an odd three-step when you take a picture. (The shutter has to be open during normal use because you're using the camera as if it is in Live View mode to frame a picture. It does seem weird however, that Panasonic decided not to protect the sensor by closing the shutter when the camera isn't turned on. I'm going to watch more carefully for pollen attachment on this sensor than I do on my DSLRs.) Flash sync is 1/160 (the E-P1's is 180). The three things that stand out in the GF1's favor over the Olympus E-P1 are: more resolution on the LCD, optional EVF, built-in flash, and slightly lower weight. On the E-P1's side: lower price, stabilized sensor, higher flash sync speed, and ISO 6400 support. While it may seem like the GF1's pluses are more important, after you factor in the price differential, I'm not so sure that still stands up for most users, especially considering the sensor stabilization of the Olympus. (Yes, I know that an optional flash for the E-P1 is more money than the built-in one for the GF1. But the GF1's flash is low power and is cut off by the standard lens hood for most focal lengths. It's not as big a deal as it sounds.) 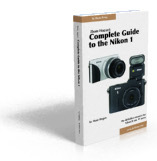 From the standpoint of a Nikon DSLR user, the GF1 is a bit like a D5000 in terms of pixels and specifications, but about 25% lighter than the smallest Nikon DSLR and about half the volume in size (most of that reduction comes in depth). The question, of course, is do you sacrifice usability or performance for that reduction. I'll answer those questions later in the review. Shooting with a GF1 is like shooting with a compact camera. The rear LCD supplies the preview of what you're about to shoot. There is an optional EVF viewfinder that slides into the hot shoe, but my brief playing with it finds it to be a far cry from the usable EVF in the G1 and G1h: it's a basic minature video display and really only gives you a crude view of the viewing area. Two questions are probably on the mind of those reading this review: is the GF1 a good substitute for a compact camera, and how does it compare to the Olympus E-P1? I'll try to answer both questions in the remainder of this review. For a user coming from the Panasonic LX3 (a solid high-end compact camera), transitioning to a GF1 is going to be fairly easy. Most of the controls are either exactly the same, located nearly in the same place (the flash release switch is on top left of the camera on the LX3 but on the top left of the back plate on the GF1), or have a substitute (control wheel instead of joystick). Moreover, the terminology used in the (jumbled) menu system is the same--such as Film Mode--so it's a bit like finding someone moved a few things in your closet, but at least they're still in the closet about where you expect them. If you like the LX3 handling, the GF1 handling isn't going to be a big issue to you. The gross impression the GF1 makes is good. The camera has a nice heft to it without being overweight, and is simple enough to use. But, like the E-P1, the details start to quickly get noticed, and the initially good impression starts taking hits. Let's start with the 14-45mm kit lens. Panasonic, unlike Olympus, supplies a lens hood, and its a robust one. Unfortunately, the lens doesn't collapse. So with the hood on you've got four inches poking out the front of the camera. The camera+lens was already not really pocketable, but with the hood, it tends to defy even large pockets. While this doesn't seem like a big thing, it is if you're thinking of using the GF1 as your carry all the time pocket camera. You're better served by picking the 20mm pancake lens for your kit, but then you're stuck with one focal length, and not my favorite (40mm equivalent). As much as I knocked the Olympus barrel locking on their kit lens, it's become my favorite of the two simply because it gives me more options for carrying around a versatile camera in pockets. If you're into neck straps for cameras, then the non-collapsing lens probably isn't a big issue, but just be forewarned that with the zoom lens, the GF1 is even further from pocketable compact than the E-P1 was. The GF1 has a better body construction design than the E-P1, I think. As you know if you've read my E-P1 review, dropping the E-P1 on the bottom plate tends to bend the thin metal covering used there. Panasonic's design for the outer shell of the camera seems more robust to me, though I haven't dropped it yet. While the GF1 isn't weatherproofed, it has fewer vulnerable joints than the E-P1, I think. Overall, the body build felt slightly more robust, despite being a slightly lighter camera. The Mode dial is where you'd expect it to be, and seems sufficiently stiff so that it isn't likely to be easily disloged to another setting. The shooting method (single frame, continuous, self timer) is a levered switch around the front of the mode dial, a nice touch. I would have liked to have seen the aspect ratio done in a similar switch around the mode dial (aspect in front, shooting method in back). Panasonic used to be more retro in bringing useful controls like these into levers, switches, and buttons film users are used to, but for some reason the GF1 takes a slight step back from that. I know why modern designers tend to shun mechanical switches: they're not as reliable long-term as buttons and menus. But you know what? The old film controls weren't broken, and we're not going to be using most of these digital cameras for ten to twenty years like we did with our film cameras. Don't get me wrong, Panasonic has done some things right in this area. The On/Off control is a switch, my preference, and not another round button next to the shutter release as it is on many smaller cameras these days. Bravo. I'm just saying I'd like more of that and less menu-diving is all. The flash itself is, well, a compromise. It's cleverly designed to pop out of a very small space, and this gets it slightly more off the lens axis. But not enough to avoid red eye, and not enough to clear the lens hood at most focal lengths. Again, the 20mm pancake is the preferred choice: the flash has no problems clearing that lens. But it's a good thing the 20mm pancake is a fast lens, because the flash itself is pretty wimpy. A GN of 6m means that at, say, f/2.8 you've got about a 2m (6') range for full flash. The "claimed" range for the zoom lens is about 3.2m (11'), but only because Auto ISO is assumed. In other words, this is not a light-the-night option. It's best for a tiny bit of fill flash when you need it. Like the E-P1, the GF1's proprietary battery isn't obvious about which way it goes into the camera. I do like Panasonic's flip out door for the battery/card chamber a bit better than Olympus', though. The AC option, like Nikon's solution for their low-end cameras, mounts into the battery compartment and displaces a special little plastic wedge to get the cable out. A bit kludgy, in my opinion, but serviceable. There are eleven (!) buttons and one controller on the back of the GF1 (two controllers if you count the button array as an up/down/left/right controller). This is, amazingly, slightly more stuff than on the LX3 to do basically the same things. And the controller--rear dial--is actually..wait for it..two controllers because it has a "switch" built into the dial (press it into the body). All this extra work really didn't make the GF1 "better" than the LX3 for controllability, so I'm not sure why it was done. If something isn't broken, don't fix it. And don't try to improve something just by changing it, you have to actually improve it. Not that there's anything particularly wrong with the GF1's back control set, but it just seems on the gimmick-for-gimmick sake side of the equation. One thing that's starting to bug me are the use of dedicated ISO, WB, and other buttons (arrayed in a circle and doubling as up/down/left/right buttons) plus the Quick Menu function. The Quick Menu function is good enough that a dedicated button isn't really saving me much time and effort, especially since the Quick Menu remembers the last thing I set, so I can get back in and out of WB a lot just as fast with it as I can with the dedicated button. We have at least three ways to set things. No wonder the manuals for cameras turn out to be 200 pages of 8-point type. Even though the buttons are raised up off the back plate on the GF1, I don't tend to accidentally reset settings with them while handling the camera as I did with the Olympus E-P1 at its default (and best) settings. It is possible to do, but it's not easy to do. There's a big difference in user frustration in that difference. The menu system is organized disorganization. There's some logic to the organization. We've got Rec, Motion Picture, Custom Menu, Setup, Mymenu, and Playback menus. But just look at those names for a moment: spell out "motion picture" but abbreviate "recording"? Really? Perhaps the Japanese version of the menu works better, but someone at Panasonic needs some good schooling in getting the English wordings right. Big time. I never knew that shutter was abbreviated SHTR (try showing that abbreviation to your spouse and ask them to say it out loud; bet Panasonic doesn't like the word your spouse just said). Seriously, guys, you want to sell 33% of your cameras to us Americans (not to mention the additional ones to the British, Australian, Canadian, and New Zealanders). You can afford to get someone who actually writes and edits the language full time to go over your menu system. And what a menu system it is. Let's see, what's something I do often? How about format a card? Assuming the last thing I did was set some camera setting with the menus, it'll take 24 button presses to get to FORMAT. Oh, you can do it faster if you remember that FORMAT is the last item on the SETUP menu and you use the scroll up instead of down trick. Do camera engineers actually ever fill a card with images? Apparently not, because they love to bury the command deep in the menu system, as if it is only used in leap years that have two moons in February. No, Panasonic needs to spend some engineering time on their menus (the LX3 has two menus, each of which has five pages). Fortunately, for my use of the camera I rarely dip into the menus, so FORMAT tends to be the top thing on MYMENU and I can get to it fast. Still, the menu system doesn't make good use of hierarchy, order, or clarity. A good menu system would. Next, we come to the LCD on the back of the camera. This is one of the differentiators between the Olympus and the Panasonic. Olympus chose brightness, Panasonic chose resolution. If you're into manual focusing, the Panasonic solution is the better choice, in my opinion, though neither is perfect. Panasonic's display doesn't have the crudeness and refresh issues in MF that I saw on the E-P1. In bright light coming from behind, you definitely need to shade the LCD to see it well. I took to keeping my Hoodman viewing loupe hanging from my neck so that I could isolate the LCD from light when I needed to. They strange thing is that, despite the fact that Panasonic really only messed up the menu system in terms of handling and Olympus really messed up some details, I'm not finding a huge preference for one over the other on handling. I could live with either, though I'd prefer both makers to address the details they missed. Battery Life:�Think compact camera, not DSLR. And surprisingly, think "thirsty" compact camera. I've yet to get through a day of shooting on one battery with the GF1 as my spontaneous camera. My maximum shots per charge was somewhere just below 300 (I was shooting only raw and using the LCD a bit more than usual), but my average was somewhere slightly below 200. Neither figure is in DSLR territory. I can go for days without charging my D90 or D300 battery, but I'm charging my GF1 battery every night. Despite the larger physical size of the GF1 battery over the E-P1, it doesn't show up in shooting. Writing to Card:�The Secure Digital write performance is excellent. I don't do a lot of continuous shooting with the GF1--mostly because I don't think it's really capable of it--so both buffer and card write speed never were a problem for me. Buffer full condition occurs earlier than you might expect for raw shooters: 7 frames, but I don't think you're going to be using this camera for serious continuous shooting. Moreover, the buffer emptying time is near the top of the mark for SD card cameras, so even if you do fill the buffer, the wait to the next possible shot is minimal. JPEG-only shooters do better. With a really fast card (Photofast 18MB/s write) the camera seems to go mostly non-stop. I certainly can't think of a real-life situation where I'd outrun the camera shooting JPEG. Autofocus System:�I've seen a lot of different opinions on this, and at first I couldn't quite understand them. But I think I've come to the right conclusion: the GF1 is much better in AF speed than the E-P1, even with the E-P1 update. I think some of the differences that people are getting hung up on are lens use. If you use either of the pancake lenses (17mm or 20mm), focus speed is fairly close between the two cameras, though with the Lumix 20mm, I'd still say the GF1 is faster in most conditions and at most settings. Put one of the zooms on the cameras, though, and things change a bit. When the lens is at f/5.6 max you can see clear and obvious differences between the GF1 and E-P1: The Panasonic is clearly faster. Indeed, in bright light conditions with the kit zoom lens, the GF1 seems about on par with many low-end DSLRs, which the E-P1 seems more like a not-quite-state-of-the-art compact camera. In low light, both systems eventually fail, though again, the advantage goes to the GF1. I couldn't focus on a full moon with the E-P1, I could with the GF1. That's a meaningful difference, actually, as neither of these cameras have the ability to press a button and get infinity focus: you're stuck with the AF system or manual focus. Unlike the Olympus, the Panasonic tended to much less hunting in continuous autofocus. I'm still not sure continuous autofocus is completely usable, though. On some subjects the GF1 seemed to be able to follow focus decently enough, while on others it would just lose focus and never really regain it consistently. Overall, the GF1 continuous autofocus produced more keepers than the E-P1, but it's nothing to brag about overall, only against the competition. Manual focus is easier to achieve on the GF1 than on the E-P1, at least if you can see the LCD clearly. The extra pixels help, but the real difference is that Panasonic doesn't try to push the enlargement help too far and has better frame rate. Thus the resulting view doesn't look like you're staring at a TV set from two inches as it does on the E-P1. Nevertheless, in bright light it's a little difficult to see focus well, and on some lenses--such as my Leica lenses with long focus throws--it can be difficult to tell when absolute focus is achieved as opposed to good-enough focus. So, as with the E-P1, I find myself mostly using single shot autofocus and reframing. This doesn't particularly bother me for my type of shooting, but if you're expecting D3-like focus performance, forget it, you've picked the wrong camera. Saturation is higher than correct at default settings. There's also a little extra contrast in most settings, including the default, which adds to the "punch" you see in the images. Color accuracy for the default sRGB Color Space, the GF1 is a bit off. The blues tend to drift magenta, the warm colors towards orange or yellow. This shows up in images. Sky tones are a Velvia-like magenta instead of the blue they should be. The shifts aren't quite as bad as the G1 made, but they're still there. Basically, if you look at the a*b* color graph for the GF1 what you see is a slight counterclockwise rotation of most colors, an indication of a built-in hue shift. The AdobeRGB values are also shifted pretty much the same way, and the supplied Silkypix converter actually increases most of these shifts, so someone at Panasonic thinks this is "right." If you use the Adobe Camera Raw converter, it does a better job of getting more accurate color from the camera. Auto White Balance was adequate in outdoor light, not at all accurate in other types of light. This is one area where the Olympus controls are better than the Panasonic ones. While Panasonic does allow you to change the Amber/Blue, Magenta/Green axis of the response, their control seems a little crude. Noise:�Let's again start with long exposure noise. On a four minute exposure (the GF1's maximum), hot pixeling is extreme with Long Exposure Noise Reduction turned off. Really extreme. Turning the built-in noise reduction on helps considerably, but the problem is so prevalent that using dark current subtraction will reduce detail. The 30 second barrier for normal exposures seems about right for this sensor. Longer than that is going to be compromised, in my experience. As I indicated in earlier reviews, I'm getting more leery of "number oriented" assessments of image quality properties like noise. That's because I have seen too many examples where an actual image from a camera with a "higher noise number" actually looks better than the supposedly superior camera with the better "numbers." Put another way: raw noise numbers don't tell you a lot, which is why I've stopped publishing large tables of them. Since some newcomers are probably reading this due to the low-end appeal of the GF1, I need to elaborate. The GF1 is reasonably well controlled for luminance noise, but somewhat poor at chroma noise. You can see this in the Imatest Noise Spectrum analysis: luminance noise has less frequency variation than chroma, especially at the low ISO values. Unfortunately, luminance is the wrong type of noise to control best. We actually don't mind luminance noise much, as it just shows up much like film grain: a pebbly underlying structure that imparts a texture on the image. Because chroma noise is less well controlled on the GF1, what we see first in noise production is color variations. The gray patches on the test target start getting this purple/green low level pattern to them, and it looks highly artificial. This is in contrast to the E-P1. Like most Nikon DSLRs, Olympus has chosen to work hard to remove chroma noise, even if that leaves luminance noise in the image. It doesn't help that Panasonic has chosen a rather high level of sharpening for the default: this tends to push noise visibility up. For JPEG shooters, this camera gets nearly unusable above ISO 800. Indeed, I'd limit my shooting to ISO 400 and lower my in-camera sharpening value. Olympus handles this much better than Panasonic, in my opinion. For raw shooters, stay at or below ISO 800 if you can and be very careful not to underexpose an image. With the right post processing noise reduction, you can get usable ISO 800 images out of the GF1, just like the E-P1. Dynamic Range:�Like the E-P1, the GF1 is not particularly great at dynamic range when compared to most DSLRs. The smaller sensor size pretty much dictates that result. Here, too, though, E-P1 users have a slight advantage over the GF1, perhaps by as much as half stop. Curiously, this proved to be true with raw images, too, though I can't 100% vouch for that as I don't think we have perfectly optimized converters for the GF1 yet. It seems clear to me that, despite using similar sensors, Olympus and Panasonic are driving the data from them slightly differently. Olympus is winning that war at the moment. Resolution:�At first I thought that the GF1 had higher resolution capabilities than the E-P1. But further examination showed that resolution data was being compromised by the higher degree of default sharpening Panasonic is using. When sharpening was reduced to what we consider a "standard sharpening" level (one pixel radius) the numbers were a bit lower than the E-P1. The question most of you have for me at this point is: E-P1 or GF1. My answer is going to surprise you, I think: the Olympus E-P1. The whole reason to acquire one of these cameras is image quality, I think. If you're just looking for a convenience camera, there are plenty of competent compacts. But if you're a DSLR user looking for DSLR-type results out of a smaller camera, than small differences in image quality start to stack up. Panasonic has made some poor decisions in their JPEG rendering: dynamic range is compromised, color noise is too high, there's a hue-type shift in colors, and the default sharpening values are too high. This combination results in JPEGs that feel a bit rough and digital to me. At least compared to the Olympus E-P1, which produces a more subtle, higher quality JPEG out of camera. Some of the Panasonic faults you can deal with: you can turn down sharpening and you can address the hue shift with judicious white balance adjustments. But you'll still have slighty more noise (or noise reduction artifacts if you get aggressive there) and lower dynamic range. Simply put: Olympus's imaging ASIC outshoots Panasonic's. If you're a JPEG shooter, this is a meaningful and real difference. Raw shooters aren't quite at the same disadvantage. Other than dynamic range, most of the differences between the two cameras can easily be addressed in conversion. The dynamic range difference may be an issue with converters not yet fully optimized for the Panasonic images, though. Overall, shooting raw I'm not finding a lot that I would differentiate between the two cameras. I think the real issue, as with most cameras shooting raw, is that the person doing the conversion needs to learn how to optimize the conversion for the sensor. Outside of image quality, the GF1 almost wins. I say almost for a couple of reasons. First, autofocus is a clear win for the GF1. If you need autofocus, or even manual focus, I'd tend to push you towards the GF1. But the GF1's kit zoom lens doesn't collapse, the camera itself doesn't have sensor-based stabilization, and the slightly better controls and built-in flash aren't big enough pluses to overcome those other two things. Frankly, I was expecting a bit more out of the Panasonic, and perhaps that's clouded my judgment a tiny bit, but it just doesn't push the m4/3 compact forward enough over the E-P1 to be a clear winner. Put another way: Olympus really only needs to match the GF1's autofocus and the E-P1 becomes a fairly clear winner, especially for JPEG shooters. I was hoping there would be more differentiation between these two cameras, but it just isn't there in terms of the camera handling. I'll start with the outside of the camera and work my way in. The AF Assist light is positioned so that the kit lens with hood blocks it from near subjects. Also, as with the E-P1, when you use this light as a self-timer light, too, it needs to be visible from behind the camera as well as in front. It should be at the far right front edge of the pop-up flash top, in my opinion. Even there the hood will block it from some close subjects. The missing direct control is Aspect Ratio. I would have liked the switch control of the LX3. The press-in switch on the rear dial is a bit gimmicky and takes some getting used to. Too often I'm adjusting aperture when I want to adjust exposure compensation, and vice versa. The problem with that is that once you discover you're in the wrong "mode", you need to cancel out the change you made before clicking in on the wheel. This just totally robs you of the directness of control you want for these operations. The "record video button" on the top panel would be better as an exposure compensation button in conjunction with the dial. I'm not at all sure why we need an instant video record button, anyway, especially when we have a Program video setting on the Mode dial. The big issue with the camera is the imaging ASIC. Color balance is skewed more than most cameras, sharpening is too aggressive, and most of the test results just show the same thing: Panasonic has some catching up to do with Nikon and Olympus and Canon. JPEGs out of the camera just aren't as satisfying as with the E-P1, in my opinion, even after twiddling with controls to try to improve upon some of Panasonic's decisions. This is a pity, as Panasonic's iAuto mode setting does an otherwise very good job of the rest of the camera settings. The menu system needs a lot of work, both on wording and organization. It seems like someone's semester project at college, not a polished system for a commercial product. Continuous focus performance could still use some tweaking, even though it's about as good as I've seen with contrast AF. While this doesn't seem like a long list, it's enough to keep Panasonic from dominating the large sensor compact market, I think. There's plenty of room for someone to get the parts in better balance for the serious shooter. �Destabilized. This pushes you towards Panasonic lenses, but not all of those are stabilized, either. �No Collapse. The zoom kit lens, especially with the hood mounted, makes this a neck strap camera, not a large pocket camera. 20mm users can ignore that comment, but then you're stuck with one focal length. JPEG Deficiencies. Color shift. Too much sharpening. Reduced dynamic range. Noise at higher ISO values. It's a suboptimal imaging ASIC compared to the Olympus. Menu Madness. Sometimes icons, sometimes words. Poor choices of words. No hierarchy. Bad abbreviations. A bit of gimmick clutter. Nice build. Good quality, all around. Controls are firm yet usable. No obvious weak points. Almost any lens fits. I can't think of many lenses you couldn't mount to this camera (with the appropriate adapter). I'm using some Leica lenses (the Voigtlander 12mm is a nice companion), but I can mount my Nikkor 400mm f/2.8 on this camera, too (it won't autofocus or use VR, though). Better than Compact Image Quality. Raw shooters especially will prefer the more DSLR-like image quality of this camera compared to compacts such as the LX3.